You might have thought that as a genre, the vampire movie was pretty much played out. 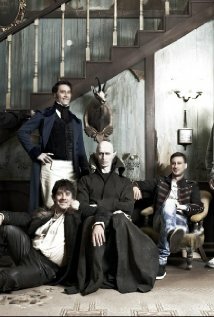 But then along comes a low budget gem like What We Do In The Shadows and you realise that there’s still a few drops of fresh blood left in the old corpse. Set in Wellington, New Zealand and brought to you by the team that gave the world, Flight Of The Conchords, this clever little moc-doc follows the lives of three flatmates who just happen to be vampires. This movie delights from the very first shot, as a hand comes groping out of a coffin to switch off a noisy alarm clock, and it maintains its momentum throughout, so that when you’re not laughing out loud, you’re sniggering and when you’re not sniggering, you’re smiling as you anticipate the next joke. Film buffs will enjoy the occasional movie reference and the three leads give likeable performances. At just 86 minutes, it doesn’t outstay its welcome and given that it’s ultimately a piece of throwaway fluff, it ticks all the boxes for a fun night out. Anyone looking for an antidote to Twilight – the series comes in for a fair bit of stick here – would be well advised to check this one out before it flaps away into the night.